Hardness rubber mounts create more strength than OE rubber mounts. Immediately experience the feedback from engine acceleration. Provide the maximum output under engine acceleration. Compound with high anti-vibration and durometer rubber material. Hardness is 150% higher than OE rubber bushings. Solid steering response and driving suspension feel. Resist side inclined while cornering at high speed maneuvers. Made with high strength and anti-crack rubber material. Viscosity between rubber and metal is about 2000KGS. Handling control and responsive steering is superior than harden rubber bush. Excellent driver feedback, precise control and solid suspension feel. Inner bushing is made accurately with both high molecule plastic tube and specific metal alloy. Outer bushing is combined by TPV material anti-dust boot, 100% resistant from dust, water and oil, extend the life of the bushing. Control arm is made by high density steel. 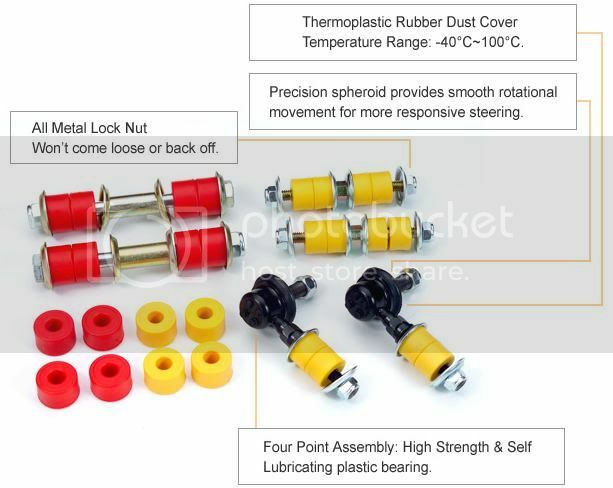 Collocation with hardened rubber bushing (street racing) or anti-dust pillow ball bushing (drifting). Provide advanced stability during high speed driving or hard cornering. Immediately response from driver's steering control under acceleration. Adjustable links are assembled with WAVE WASHERS between nuts and bolts, which enable both of them can tight more harder, won't come loosen or back off. In additional, WAVE WASHERS allow many times loosen and tighten again, unlike competitor's products are difficult to loosen or tighten while doing the next alignment in the future. Made of state of art material THERMOPLASTIC, unlike polyurethane material as easy broken. Resistant to oil, alkali and ozone, self-lubricating, resilient, high strength and hardness. Combining the benefits of two key materials: strength from plastic and compression from rubber. Withstand severe weather conditions, and will not brittle, crack or discolor with age. Temperature range: -40�C ~ 100�C. Crack or brittle from OE rubber or polyurethane bushes is solved by THERMOPLASTIC. 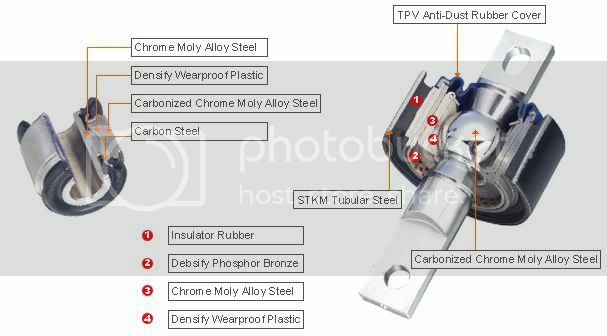 Precision assembly production enables spheroid, self-lubricating plastic bearing and bracket has a tight joint, provides consistence quality and longer life. Unlike any other traditional ball joint are easily to loosen after installed for a period.